Abbey Road was released in 1969, showing four iconic musicians known as the Beatles crossing a street—one used as the title and cover of that album. Now 45 years later, all hell is breaking loose. The Independent’s Christopher Hooton reports tourists and Abbey Road aficionados alike are hindering traffic flow at the famed crossing just so they can capture the moment in their own priceless manner. 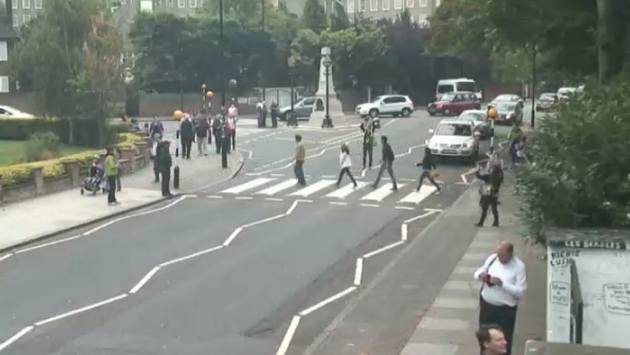 In fact, if you have a few minutes or a full day, you can take a look at the crossing at the Abbey Road Studios live feed. 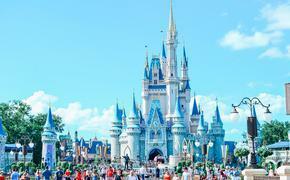 Fast forward to today and fans continue to cross the street just to say they did. While aggravating, that has nothing on some of the stuff in India Sturgis’ Daily Mail report, which features images of people crossing in costumes and one person who decided to don a yellow submarine for the occasion. I decided to play along and instantly spotted a few tourists imitating the band with one member of the party snapping off a picture amid traffic, which you can see in the very first picture at the top of this page. This is that rare occasion when a tourist hot spot also happens to be a congested artery through St. John’s Wood. Not only do drivers have to stop for those who want to snap a quick photo of themselves, they have to contend with the myriad others who just want to cross for crossing’s sake. It has to be frustrating if that’s a road you simply have to take on a daily basis. If that’s the case, we suggest that poor soul relocate, because the Beatles’ Abbey Road pilgrimage doesn’t seem to be slowing anytime soon.